Unknown assailants have killed the son of one of the victim representatives at peace talks between Colombia’s government and rebel group FARC. Almost one in four of the representatives have received death threats because of their participation, they said Friday. 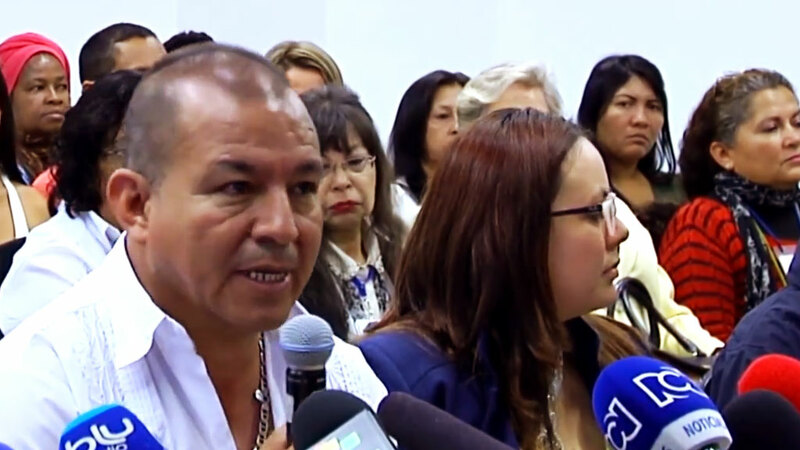 The 60 victim representatives taking part in the peace talks held a press conference in Bogota to demand attention to the increase and death threats they have received because of their participation. At the same time, the victims called on the government to proceed to agreeing to a bilateral ceasefire with the FARC in order to de-escalate the armed conflict that has been wreaking havoc for 50 years. Nilson Liz, a representative of farming communities in the troubled Cauca region, told press at the meeting that following his trip to Cuba, unknown assailants murdered his son Dayan. “My son died on January 1. Unfortunately we have not heard a clear argument from the Prosecutor General’s Office that determines which were the motives,” said Liz, not knowing whether his son was killed over his participation in the talks or for other reasons. The farmers’ representative has long been submitted to extreme violence. Liz’ organization, an association of small farmers seeking the return of lands stolen by paramilitary and guerrilla forces, has had 90 of its leaders assassinated since its foundation in 1970. He was accepted to the victims commission under his condition as a displaced farmer, but has been the victims of numerous horrible acts. According to weekly Semana, Liz was the victim of multiple assassination attempts between 1997 and 2003. Additionally, he, his wife were kidnapped. “They took us to the bush and took all our belongings, but we were able to flee,” the farmers representative told the weekly. Also after the death of his son, Liz has continued to receive death threats just like other leaders of the association. “On January 28 I received a condolence card” for his own pending death, said Liz. Like the displaced farmers’ representatives, 13 other of the 60 victims representatives have received death threats or an increase in death threats since announcing to participate in the talks and preparations of a subsequent peace process. “Victims and human rights defenders are still subject to several acts of violence, attacks and intimidation. Particularly the five [victim] delegations that have visited Havana have seen an increase in threats and displacement,” the representatives told the press. According to General Luis Mendieta, a former FARC hostage, the government agency in charge of protecting threatened persons, the National Protection Unit (UNP), has provided extra protection to 14 of the 60 victim representatives. “The vast majority of them work in rural areas where you really feel the intensity of the conflict,” Mendieta said. Victim representative Nora Eliz said she did not receive extra protection when her participation in the peace talks resulted in an increase in death threats. “I receive protection from the UNP but neither the prosecution nor the protection unit have done anything with the new threats,” Eliz told Semana. According to the representative of the United Nations in Colombia, Fabrizio Hochschild, the threats are coming from neo-paramilitary groups that emerged from the AUC, a paramilitary group that was formally demobilized in 2006 by former President Alvaro Uribe, a staunch opponent of the peace talks with the FARC. Extremist elements within Uribe’s conservative Democratic Center party have previously slammed victims for taking part in the talks. “If we are talking about people who already have suffered so much, why is the focus on them? Because they are talking about peace,” Hochschild said. In spite of the violence, the victims said they would continue contributing to the peace process. The representatives called on the administration of President Juan Manuel Santos to reciprocate a unilateral ceasefire called by the FARC in December and to formalize exploratory peace talks with ELN, the country’s second largest rebel group. Peace talks have been ongoing with the FARC since November 2012. The government and the ELN announced to be having exploratory talks in June, but have since failed to formalize these talks. Both groups were formed in 1964 and have been fighting the state since then. The conflict that has been ongoing since then has left more than 900,000 deaths and more than 6 million displaced.